3 drops 3 times daily sublingually, the dosing may be gradually increased. In case of cancer, the recommended dose is min. 60 mg CBD daily. Cannabidiol in the form of CBD oil constitutes a very comfortable form to use. A given amount of oil should be placed directly under tongue or in food. Estimating a constant dose may initially be quite difficult, as it is an individual value, therefore it is worth starting from the smallest portion and controlling the dose, with which the desired effect is noticed. It is best to apply a given dose for a certain period of time (e.g. a few days) and observe, how our organism reacts and then evaluate if regulation of the dose is necessary. In case of cannabinoids, more will not always mean better, therefore increasing the dose should be gradual. 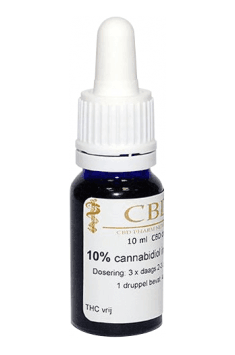 CBD (Cannabidiol) – a cannabinoid which is the second biologically active compound in Cannabis indica, along with THC. Supplements with CBD are completely legal in Poland. Despite of the lack of psychoactive properties, which are characteristic of THC, this compound shows a wide spectrum of effects on the body, especially mental functions. By acting on the endocannabinoid system, cannabidiol is a compound with a significant impact on emotional states. It is capable of relieving excessive tension, promoting relaxation and increasing the body’s tolerance to stress. Supplements with CBD are recommended to promote the treatment of some mental disorders. Medicines based on cannabidiol are also slowly entering the market. What is more, it is important that CBD has the ability to reduce the sensation of pain. It is indicated as a natural pain-killing agent. Taking into account its relaxing properties, supplements based on CBD are recommended to help treat spastic paralysis. In addition, some sources show that CBD is capable of promoting the body’s immune function. It is also suggested that this compound may aid in the treatment of cancer.